Philip Gelinas may be more than twice the age of some of his students, but the 59-year-old mixed martial arts practitioner is gaining respect, and lots of business within the Montreal MMA community. Gelinas owns and runs Gelinas’ Academy of Mixed Martial Arts, located on Mayor St., about halfway between the McGill and Place-des-Arts Metros. GAMMA’S location is great, but Gelinas’ credentials are even better. He has one of the highest ranks in Kajukenbo (a Hawaiian mixture of a number of fighting techniques like Kung Fu, boxing, and Jiu-Jitsu), holding the title of ‘Grand Master’ by attaining a ninth-degree black belt. At the age of 14, Gelinas didn’t know why he was so fascinated by martial arts, but it was a passion which has ultimately dictated his life from there on. He was inspired by his Kajukenbo teacher to travel to the Philippines and, following years of training in the Filipino Martial Arts, he eventually won the Grand Championship at the International Kali Grand Championships at the age of 36. “I was fighting a younger light-weight winner. I was exhausted and thinking about what table I could just crawl under and die, until halfway through I heard [my opponent’s] girlfriend say, ‘Come on Kali, you could beat him, he’s old,’” said Gelinas. “If there’s anything to spark you to strike, it’s the idea of hearing that you can’t do it anymore. So I got up, and gave him the beating of his life,” laughed Gelinas. After years of practicing Chinese Kenpo and Kajukenbo, Gelinas felt the obligation to pass on his teachings. And that’s exactly what he did. In 1983, Gelinas took a risky leap and rented his first space in Old Montreal. After years of failing, succeeding and learning from his mistakes, Gelinas hung up the gloves and now teaches a school of eight martial art disciplines, 10 instructors, and too many students to count at the new downtown location. Teaching the art was probably for the best, as some of his past students have now become success stories and are glamorized on GAMMA’s wall of fame—one of them being current Ultimate Fighting Championship welterweight champion Georges St-Pierre. St-Pierre came to GAMMA because of instructor Fabio Holanda, a Brazilian Top Team black belt and the head of BTT Canada in Montreal, which operates out of GAMMA’s gym. GAMMA has now become one of the top Brazilian Jiu-Jitsu programs in the country, and was part of St-Pierre’s team during his 2008 UFC wins against Matt Hughes and Matt Serra. Though not every student who walks into GAMMA comes out a UFC contender, Gelinas is grateful for those who work hard and care for their own mental and physical well-being; he would rather have an apprentice who cares and tries than someone who succeeds without putting in serious effort. 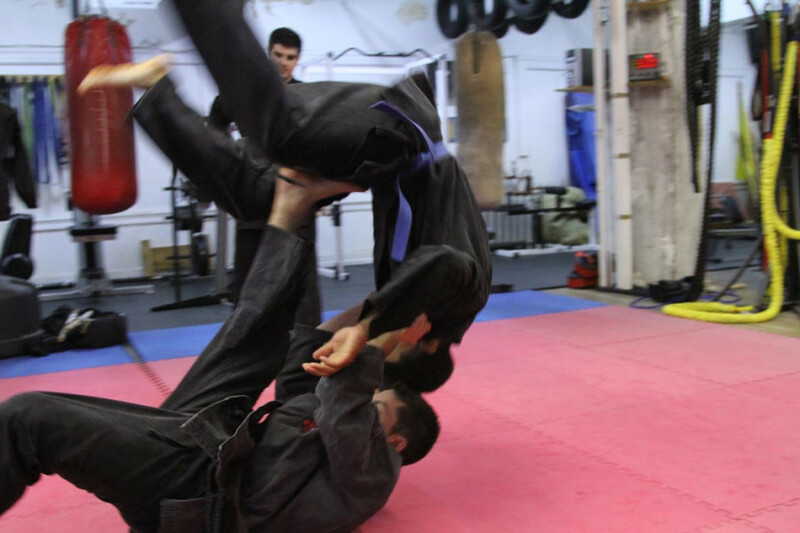 The MMA club does not promote students to a higher belt as easily as other martial arts institutions. Gelinas tries to push his students to their full potential, ensuring they will be prepared for anything they might face in competitions—or on the streets.